It’s not often IT equipment is likened to one of the finest cars ever manufactured, but if we were going to, then we’d have to hail the ZBook the Aston Martin of the laptop world. Not just a laptop, in fact, but a ‘mobile workstation’. 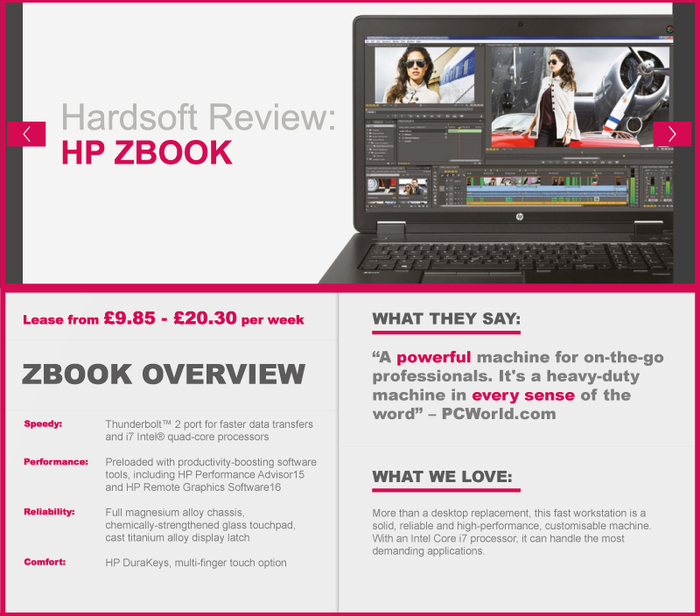 HP’s ZBook was launched in 2013 and has proved hugely popular with tech industry experts and consumers alike, receiving favourable reviews across the board. With unparalleled engine technology, good handling and smooth steering, we thought we’d take a look at the range WHILE channelling our inner Top Gear presenter. No two laptops are the same, and there certainly aren’t many which can match the ZBook. With screens available at 14”, 15.6” and 17”, this is a sturdy, solid machine which comes with one of the best processors around at the moment. It’s fast, too; the Thunderbolt™ 2 port allows for much faster data transfer, helped by the Intel® i7 quad-core processor. This means that the ZBook can cope with even the most demanding applications, so it’s ideal for everyday business, demanding CAD programs, demanding media editing…you name it. Though it might be situated in the upper price bracket, the ZBook really is a serious, highly-respected device that you’ll want to show off – much like the Aston Marin Vanquish, though you’ll have to stump up a little more for the car than the workstation. Additionally, it comes pre-loaded with loads of productivity-boosting software, such as HP Performance Advisor 15 and HP Remote Graphics Software 16, so you can be confident of good performance and reliability. The device itself is described by HP as possessing ‘precision stamped full magnesium alloy chassis, chemically-strengthened glass touchpad and cast titanium alloy display’ – if that doesn’t sound automotive in design, we don’t know what does. It’s also received rigorous testing ‘beyond industry standards’ and comes with full warranties. Though it’s been called ‘heavy duty’ by PC World, it is a sleek piece of high-performing, reliable, engineering – much like that aforementioned car. When you power up the ZBook, you feel in control; together, you are driving through applications effortlessly and with speeds which easily handle the demanding software that designers require for showcasing their creativity while on the move. Just as the Vanquish can reach 0-60mph in 3.6 seconds, you’ll see that the fast, high-end processor ensures your ZBook journey is a smooth, powerful and comfortable ride. Yes, it might be sturdy and in some reviews, the ZBook’s size is listed as a disadvantage. However, if you’re looking for something smaller, there is always the Microsoft Surface Pro or the iPad Pro. We like the fact that the ZBook is larger, it makes you feel safe, somehow. It reminds you that this is a powerful and versatile machine. It might be large, but it’s lightweight at the same time. And while a touch screen doesn’t come as standard, there is an option to add one to shift your user experience up a gear. What’s great about the ZBook range is that it’s expandable; the workstations include many configurable features which allow you to boost memory, storage and graphics as you so please. Its ‘scalable memory subsystem’ allows for reconfiguration without having to overly increase power or cooling. A common criticism is the price; they tend to start at around £825 for the ZBook 15u G2 with i5 processor, right up to £3,000 for the very latest incarnation. You get what you pay for, of course – this isn’t a toy – it’s a serious piece of kit. You wouldn’t expect to find an Aston Martin for under a grand, would you? That said, there is a more economical way of getting your hands on this enviable technology: leasing. Our HP ZBook leasing plans start from around £12.00 per week, so you could have this mobile workstation without having to fork out hundreds in advance. The HP ZBook mobile workstation is a beast, a piece of serious technological innovation which has been specially designed with businesses in mind, but we know it’s not for everyone. An Aston Martin is for a serious car lover, someone who adores driving – the ZBook is for those who want to produce serious creative projects on a mobile device, safe in the knowledge that it will deliver powerful results. 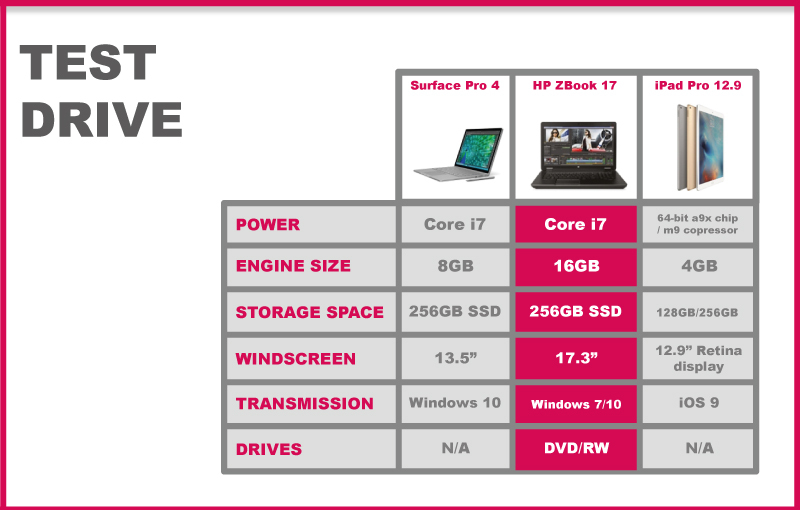 The screen on the 17.3” model ranks among the largest on the market and the device is constructed with what HP claims is its ‘most powerful processing and graphics, consistent color… simple scalability, and the blazing-fast connectivity you need to perform and collaborate at the speed of creativity’. It’s also fitted with a DreamColor Display which has been specially designed by professionals, boasting a higher resolution without any lag in the graphics or performance – meaning higher accuracy, larger work space and clearer detail. The sleek bodywork encapsulates 16GB of storage, but can be expanded up to 2.87 TB, if need be. While an optical drive seems old hat for a lot of people, it’s useful for those who plan to use it for work and is therefore is a big tick in the box. While the ZBook is technically classed as a laptop, it’s a workstation and not a mobile device in the true sense of the phrase. It’s not something you’d pop in your bag and realy on for quick directions – but that’s what your sat nav is for. If you’re looking for something smaller, then, you would probably do best to consider the Microsoft Surface Pro and iPad Pro. They’re just as powerful as the ZBook and storage is about equal, but they do come with the touchscreen elements and the optional stylus with which your creations will be drawn. However, keyboards need to be purchased separately, so if you don’t want to type on a screen-dividing touchpad, maybe the ZBook is the better route to take. The tablets are fun and they are visually appealing. They offer good audio and people in both camps love their products. When all is said and done, ultimately, comparing the ZBook against the Surface Pro and iPad Pro is meaningless; the three devices are so very different and individually brilliant for their intended audiences, it would be like comparing the Aston Martin with a Ducati Desmosedici RR motorbike or a Pinarello Dogma F8 bicycle – impossible. You won’t know how good the handling is on any of them until you take them out for a test drive yourself. Just like the Aston Martin is intensively tested for durability and performance in extreme conditions, HP’s workstations similarly go through a rigorous certification process, to guarantee that users receive the best possible experience. Some 115,000 hours of testing, to be precise, undertaken by HP’s ‘quality-fanatical’ engineers. Like the luxury car, the ZBook tests also cover durability, covering performance in varied frequencies, voltages and temperatures. The workstations are also put to the test by Independent Software Vendors (ISVs) to ensure that applications run as they should. The certification is proof that the ZBook’s hardware and software are compatible and offer optimised performance. You, therefore, can use the workstation in full confidence that Adobe Photoshop CS6, for example, will operate dynamically and at top speeds. For what it’s worth, we believe the ZBook range is the pinnacle of business-suitable mobile working; reliable, fast and powerful – ideal for those with home offices or that are always on the move. Aston Martin has said its goal in creating the Vanquish was to ‘produce the most technically advanced Aston Martin in history’ – we wonder if perhaps HP’s goal with the ZBook Workstation was the same? To discover more about ZBooks, leasing or any of our other products, please call us on 0207 111 1643 or get in touch via email.